HNS attended Wondercon this past weekend where we interviewed the cast and creator of Syfy’s Deadly Class. We spoke about the show’s epic season 1 and how we’re all crossing our fingers for a Season 2 announcement ASAP. Check out our exclusive interviews below with Benjamin Wadsworth, Maria Gabriela de Faria, Taylor Hickson, Luke Tennie, Liam James, and Creator Miles Orion Feldsott! 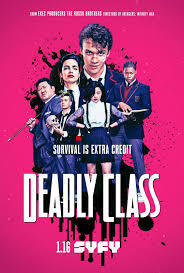 Series Description: Set in a dark, heightened world against the backdrop of late 80s counter culture, Deadly Class follows the story of Marcus, a teen living on the streets who is recruited into Kings Dominion, an elite private academy where the world’s top crime families send their next generations. Maintaining his moral code while surviving a ruthless curriculum, vicious social cliques and his own adolescent uncertainties soon proves to be vital. Based on the best-selling 2014 Image Comics graphic novel, Deadly Class is a coming of age journey full of ancient mystery and teen angst. *Interviews below conducted with multiple media outlets. You can catch Season 1 of Syfy’s Deadly Class on the Syfy website & Syfy app!